If you're unfamiliar with the ever-changing tax laws or frightened by the threat of an audit, you've probably missed out on taking perfectly legal write-offs in the past. With J.K. Lasser's 1001 Deductions & Tax Breaks 2007 as your guide, you can stop worrying, and start saving, because you'll learn exactly how to take advantage of every tax break and deduction that you may be entitled to--without running afoul of the IRS. Fully updated and completely revised to reflect important changes in this year's tax laws, J.K. Lasser's 1001 Deductions & Tax Breaks 2007 can help you save more than ever before on your tax bill. Chapters are clearly organized by subject matter so you can easily find situations that may apply to you. Each tax benefit is also clearly explained--along with the eligibility requirements for claiming the benefit--while planning tips and common pitfalls associated with the benefit in question are discussed in detail. New tax law alerts are also included throughout the book, so you can make the most informed decisions possible. 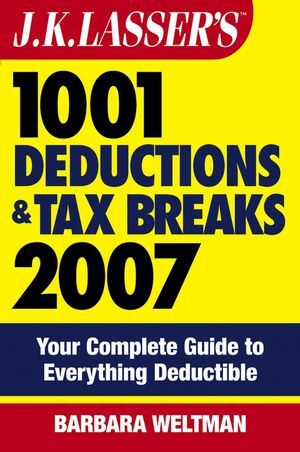 J.K. Lasser's 1001 Deductions & Tax Breaks 2007 is packed with hundreds of updated deductions and credits, practical advice, and real-world examples. It's a book every taxpayer should own. You will also get access to an online supplement to this book, bringing you up-to-the-minute tax law changes. BARBARA WELTMAN is an attorney and a nationally recognized expert in taxation for small businesses, as well as the author of several top-selling books on taxes and finance. She is also an experienced writer and has been featured in many media outlets, including the Wall Street Journal, Inc.com, Bloomberg TV, CNN, and CNBC. Sign up for her free e-newsletter at www.barbaraweltman.com.